More and more travelers, in particular, families are discovering the villa option and choosing to vacation at a villa instead of a resort because often times, it is a much better value per person than staying in multiple hotel rooms or resort suites. 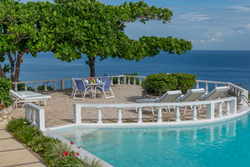 This month, Villas of Distinction®, a full-service premier luxury villa rental provider with an extensive portfolio of thousands and as part of World Travel Holdings, is giving consumers the chance to win a luxurious vacation at a 5-bedroom staffed villa overlooking breathtaking Montego Bay. The winner can bring up to 10 guests to experience Cliffside Cottage which offers stunning panoramic views of the Caribbean Sea. Guests will truly enjoy quality time with family or friends being pampered by the villa’s full staff including a cook, butler, housekeeper and laundress. Imagine being waited on while dining or sipping a drink on the villa’s verandah, or taking in the breathtaking views while lounging by the private pool. If the winner and guests want to venture out, there is access to the nearby Round Hill Resort with a spa, fitness center restaurant and more, or the included Tryall Club Membership provides access to one of the Caribbean’s finest a golf course, water sports, events and other fun activities. To enter to win a 7-night stay at Cliffside Cottage in Montego Bay, Jamaica, and for terms and conditions, visit the “Win A Villa Vacation In Jamaica” contest page by March 31, 2016. For more information or to book a villa vacation, visit VillasofDistinction.com or call 1-800-289-0900.